The Syria crisis is complex. But it can only be resolved when a number of simple decisions are taken on the part of each of the powers, Syrian or foreign, competing for the Syria pie: Should each party continue to fight to achieve a decisive victory or is it time to reassess their initial expectations? Before that assessment takes place, there WILL be more escalation. All the parties involved in the conflict are feeling over confident. After 20 months of the conflict, leaders’ egos and their nations’ pride are on the line. Delusional expectations can easily lead to war just like they did throughout history. “We all have a responsibility to work for a resolution of this profound and extremely dangerous crisis that has potentially massive repercussions for the region and the world.” United Nations Secretary General Ban Ki Moon. The United States “isn’t smart enough” to solve the Syria crisis and “would pay a heavy price for intervention,” Brent Scowcroft, former American national security advisor. “The world is closer to serious danger than it ever was in decades (because of Syria mainly) … Any serious miscalculation will a create a problem we will not be able to handle” Former UN secretary General and Syria envoy Kofi Annan speaking on the Jon Stewart Show on Sep 17th 2012. So what can be expected next? America’s template for relying on “the rebels” to topple governments not sufficiently compliant with American directives is by now well known: Start with political and media support for the rebels until popular opinion in the US and Europe sees the conflict taking place between a good side (the rebels) and an evil side (the regime), … then provide non military aid … then encourage your allies to provide them with military supplies … then finally provide them directly with much more lethal military aid. Instead, there is currently significant interest in the United States and among its allies in the Middle East in sending more serious arms to “the rebels” if certain conditions are met. Another report, published on the same day in the New York Times, raised more questions about the rebels, or the FSA, that the Unites States is considering empowering. In other words, Kissinger is saying that the Syrian regime and the millions of its supporters are 1) fighting for their survival and 2) Are not going to be defeated without serious, boots-on-the-ground military intervention by NATO/Turkey. 1) Sectarian conflict will intensify, last for many years and spread to Lebanon, Iraq and Turkey. 2) Iran, Iraq, and Lebanese allies of Syria will likely get involved in a regional war between Syria and Turkey. 3) Jihadists will have the upper hand on the opposition side. They are the fiercest fighters and they will not stick to promises they gave to the United States or to secular Syrian opposition generals who helped them obtain American weapons. 4) It will be impossible to rebuild Syria. Syria will be turned into a failed state and will export chaos to the wider Middle East for years, if not decades. Sadly, state department is staffed with individuals lacking in skills, knowledge and sound judgment. Congress and Think Tanks are more interested in satisfying AIPAC and American mainstream media is almost always blindly behind any policy they are sold by the spokesperson of State Department. As we learned from previous failures, there are no effective safety valves when it comes to America’s foreign policy decision making. For many decades the United States failed to score any major success in the Middle East. There aren’t many reasons why one should expect a re-emergence of constructive and effective leadership from Washington DC. The United States will probably continue to play a highly destructive role in Syria, and Syria will not be the only nation that will suffer the dire consequences. What are the consequences of a collapse of central authority in Damascus? The Arab Israel conflict. Syria was the only remaining major Arab resistance state. Hamas and Hezbollah were Syrian allies. Lebanon. The only factor that decides political blocks in Lebanon is Syria. Governments, or opposition blocks were uniformly pro Syria or anti Syria. Iran’s role in the Arab world. Syria is Iran’s gate to the Arab world and its main ally in the world. Turkey’s role in the Arab world. Syria opened the gates to Turkey’s return to the Arab world after decades of focusing on its European neighbors. Kurdish issue. Syria is one of the four countries with a sizable Kurdish population. Iraq. Syria played a serious role in Iraqi politics. Sunni Shia conflict. Syria was continuously shifting its regional weight to try stabilize the Sunni Shia balance of power n the Middle East. 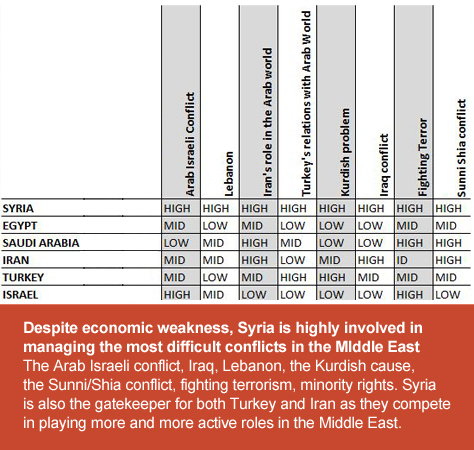 To balance Syria’s alliance with Iran, Syria developed its relations with Turkey to comparable levels, Syria sided with Iraq’s Sunnis to balance Iran’s excessive influence in post-Saddam Hussein Iraq. Syria also sided with Saudi Arabia against Iran in Bahrain. And Syria sided with Saudi Arabia against Yemen’s Houthi (Shia) insurgency. Now it will be difficult to predict what the new Middle East will experience after the changes taking place in Syria. A total collapse of central government in Damascus will lead to an exponential increase in the complexity of managing the region’s different conflicts. The risks should not be taken lightly by any sane decision maker. Additionally it is generally accepted that stability in Saudi Arabia and the rest of the GCC states is now dependent on the outcome of the conflict in Syria. Price of oil, negotiations with Iran, and Israel’s decision to bomb Iran are all linked to the outcome of the Syria crisis. Next to Syria, Turkey is arguably the country that paid the highest price due to its foolish involvement in the crisis. Going to war cannot be in Turkey’s national interest just like it certainly would have serious implications on Syria’s integrity as a country. Superpowers often encourage local powers to go to war on their behalf. Some overly ambitious political leaders are easy to manipulate through promises by their super-power allies. Those promises usually do not materialize and highly costly confrontation is the more probable outcome. Below there is a series of photographs from my family’s original history photo collection at www.mideastimage.com showing how the Ottoman empire entered World War I as Germany’s ally. Germany was interested in using the Ottomans’ leadership of the Islamic world to provide it with the necessary reserves of fighting man power supplied by various Islamic countries. The Ottomans felt the power of being valued by Germany (the super power) for their leadership of the Islamic world. The short lived power trip led instead to the dismemberment of the Ottoman Empire that was already suffering from ethnic and sectarian tensions. Today Turkey and Syria are candidates for a repeat of the 1914 mistake. A similar outcome awaits the two nations if they went to war or if they failed to realize that it is impossible to win. There are millions of Syrians on both sides of the conflict fighting for their survival and their aspirations. No one can or should defeat them. Turkey’s dangerous and illegal intervention in Syria must be stopped. The Syrian regime and Syrian opposition must do more to display a convincing commitment to a meaningful dialogue. The US should resolve, instead of complicate, the Syria crisis. It can. “The only way human beings can win a war is to prevent it.” General George Marshall, former chief of staff of the Army, secretary of state and secretary of defense.